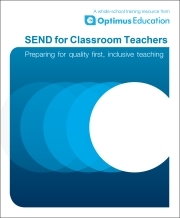 With the new SEND Code of Practice now in place (since September 2014) and fewer pupils fulfilling the criteria for additional support, are your classroom teachers ready to take responsibility for meeting the needs of all their pupils? These ready-made training materials can be used by the SENCO or training leader to equip new teachers with the knowledge, skills and understanding to provide quality first teaching to SEND pupils. enable school-based training leaders to equip new teachers with the skills they need to support 21st century learners. Professor Des Hewitt, Professor of Teacher Education, University of Derby. Gareth D Morewood is Director of Curriculum Support [SENCo] at a large comprehensive secondary school in the north-west of England, awarded an ‘Outstanding’ judgment by Ofsted in June 2011. He is a passionate advocate of inclusive education, has written extensively and regularly speaks at national conferences, particularly on provision within mainstream settings for students with complex needs.